I love a good mini album. I find that mini's are the perfect little canvas to chronicle a vacation. I like to include some small bits and pieces in my PL album-which also happens to be mini- and then do a full mini album on our full vacation including the little ephemera that I've picked up along the way. 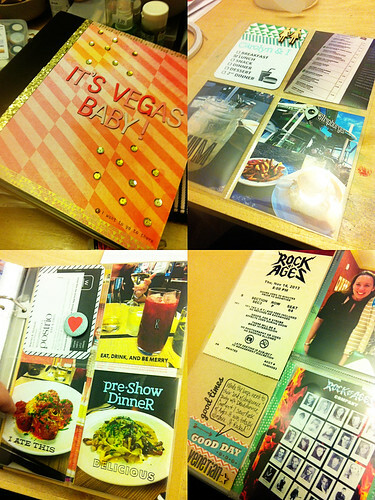 I'm currently working on our Las Vegas mini album. We took our trip in November & it was a great one! We had so much fun, ate good food & even had some great company. I'm using a combination of a couple kits I'm trying to kill and some KP product including some stamps & tiny alphas.